If you are vegan (or have other dietary needs) you know in most cases your cruise holiday consists of negotiating with the galley team to order your special meals. And while at home we can easily avoid non-vegan food, on a cruise it can be difficult with the mountains of meat on show in the restaurants. Vegan desserts can often be poor (fruit plate, sorbet) and are certainly lacking in comparison to what the omnivorous guests are treated to. Yet, we vegans pay the same cruise fare but don’t get the same quality experience. In fact, we can often rustle up better meals at home than those we are subjected to by uninspired chefs. What to do if you want to avoid that disappointment while on holiday but you want to cruise too? There is one sure way to sail the vegan way that means convenient existing vegan menus, vegan drink and no animal products to dodge while onboard. Sounds amazing? It really is! 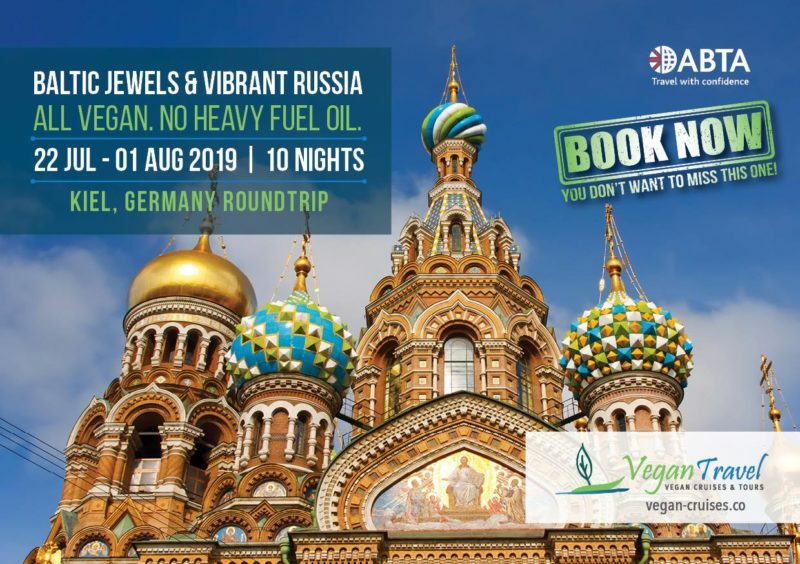 This summer, July 2019, Vegan Travel host a 10-day vegan Baltic cruise and you too can get on it if you are quick. And you can sail the vegan way with many of their happy repeat customers. I assure you that once you sail the vegan way with Vegan Travel, going back to regular ships and their lackadaisical offering is so much harder. In December 2018 I went on a Christmas markets river cruise with Vegan Travel (see more about the trip here) and it was the best cruise experience I have had in vegan catering terms. For the first time, I felt I got my money’s worth in food terms. It was so wonderful to be able to order off the menu at each mealtime. So convenient I didn’t have to query if the wines were vegan. I sailed with a shipload of other lovely vegans, veggies and a few vegan-friendly omnis too, I discovered. Think of a vegan festival or event you’ve been on and how amazing it was to be able to eat and drink everything and knowing you weren’t the odd one out. Now take that few hours of vegan camaraderie and extend it over a holiday. On a ship, river or ocean. Sounds pretty close to heaven, doesn’t it? Vegan Travel offers just that. Who are Vegan Travel – and why do they differ from other vegan event cruises? Vegan Travel is a German company established in 2013 when the owner Dirk had a conversation in a pub over a beer lamenting the fact that cruise companies weren’t really catering for vegan guests. 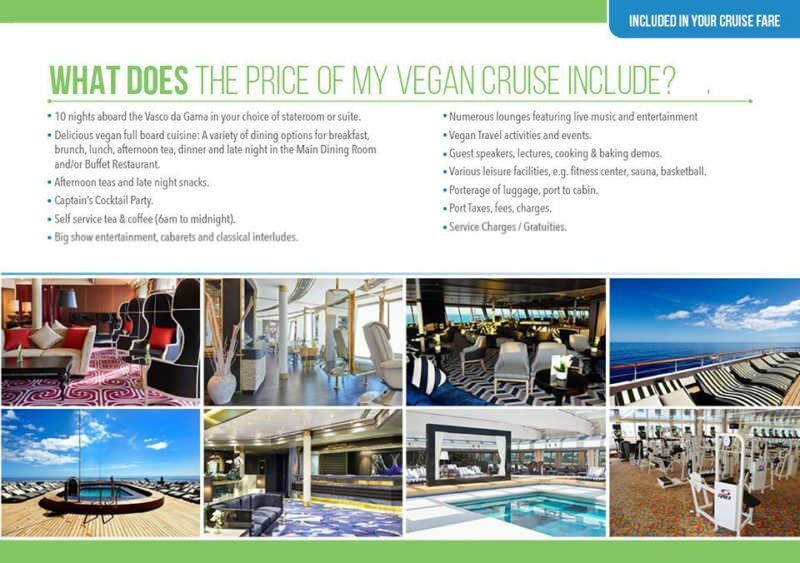 Imagine if there was a fully vegan cruise option available? Well, many of us have had that kind of conversations over a drink. But very few of us have made those ‘what if’ conversations happen. 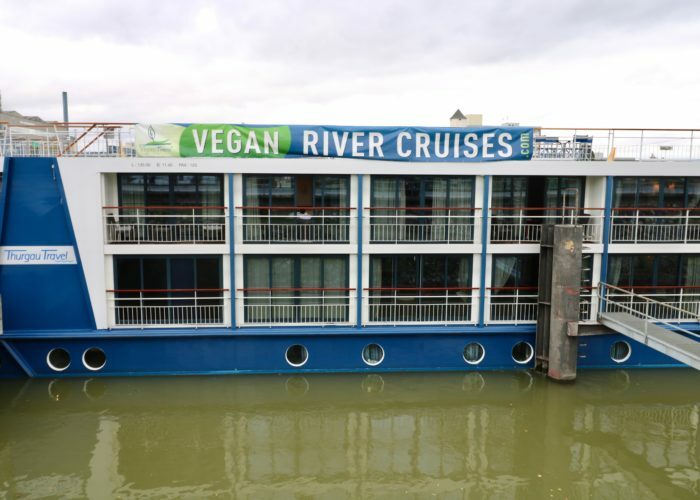 The following year the first vegan river cruise took place and since then Dirk and Vegan Travel team have organised a great number of all vegan European river cruises for us to enjoy. 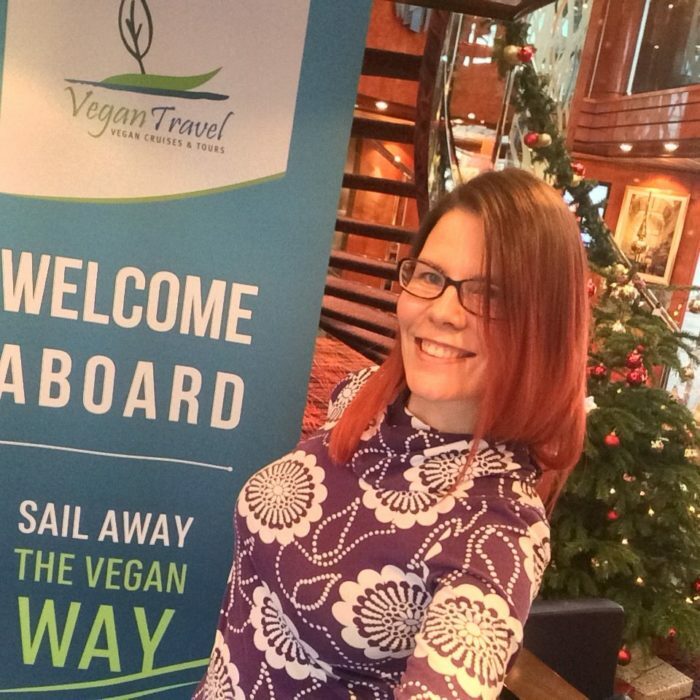 In 2017 Vegan Travel brought us world’s first all-vegan ocean cruise from Tilbury to Norwegian Fjords by hiring out CMV Columbus for the exclusive use of their customers. Sure, there have been vegan group cruises before, where small groups of vegans sail together on an otherwise omni ship – like Holistic Holidays sailings are. But Vegan Travel went one further with this exclusive CMV charter. Much like their earlier river cruise sailings, the Norwegian fjords ocean cruise was an all-vegan affair with all food, drink, and passengers there for the vegan experience. With entertainment and guest speakers onboard specifically for the vegan guests. This year’s quirky offering is a river cruise, but not in Europe. In less than a month, a group of vegans on a Vegan Travel sailing will cruise on two small river boats on the Mekong Delta – from Vietnam to Cambodia. A second river boat was added due to high demand – there are three cabins left apparently so if you can go in late April – you can river cruise the Mekong all vegan! Not just vegan river cruises – oceans too! Vegan Travel started with various river cruises but their first all-vegan ocean cruise dates back to autumn of 2017 – their successful week-long cruise to Norwegian fjords with CMV. This fab Youtube video compilation from this first ever 100% vegan ocean sailing will give you a peek as to what you a vegan ocean cruise can entail. Last year Vegan Travel branched out and arranged an all-vegan expedition cruise to Chile and Patagonia, offering something totally different to those looking for an adventure that goes beyond calling at traditional cruise port beaches, cities, rivers. There were glaciers, penguins and much more! No penguins for 2019 but an exciting ocean itinerary ahead regardless – one I would be more likely to book, as I do like my ocean cruise comforts. Expedition cruising isn’t for all of us, after all. 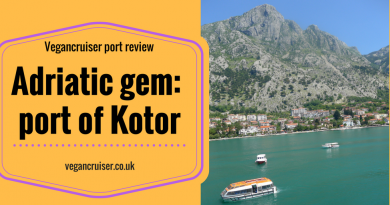 But if something like the Norwegian Fjords cruise interests you – I have just the holiday for you! 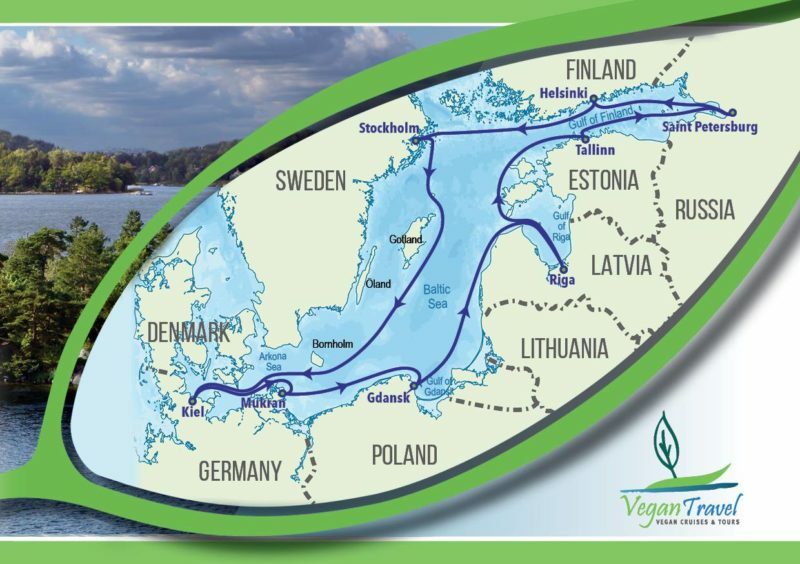 In 2019, Vegan Travel are treating their dedicated fans to a ten-night Baltic ocean cruise. The name might make you think this is another cool weather cruise but the Baltic nations in the summertime are considerably warmer than the UK. And brighter, with the midnight sun too making the days endless. This exciting end of July 2019 itinerary has a lot to offer. It features stunning Nordic capital cities of Helsinki and Stockholm with beautiful archipelago, architecture and interiors. Both Finland and Sweden are exceedingly vegan-friendly, plus nearly everyone speaks English so finding your vegan treats won’t be difficult. You could even sample the tasty McVegan or vegan Subway, if vegan junk food is your thing. On this vegan Baltic cruise, you will also get to explore former Baltic state capitals that once were part of Soviet Union (Tallinn in Estonia, Riga in Latvia). There also is a visit to St. Petersburg, Russia with an overnight stay – giving you two days to explore this historic city. So, what’s the ship hosting this vegan Baltic cruise? Like the Norwegian fjords sailing in 2017, the 2019 Baltic ocean cruise will be on another CMV ship. 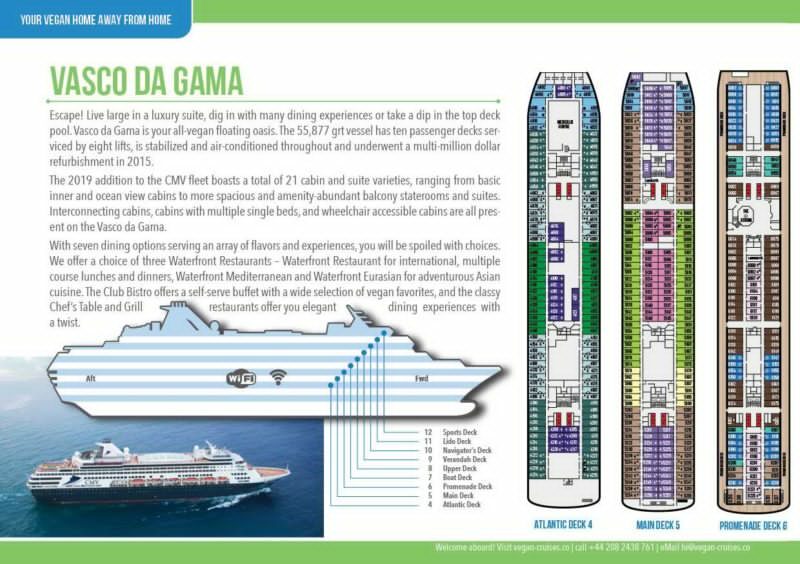 Your floating vegan home, when you book this sailing, is CMV’s latest addition to their fleet: the Vasco da Gama. Some of you may have even sailed on her before as she was once Holland America’s Statendam and more recently P&O Australia’s Pacific Eden. 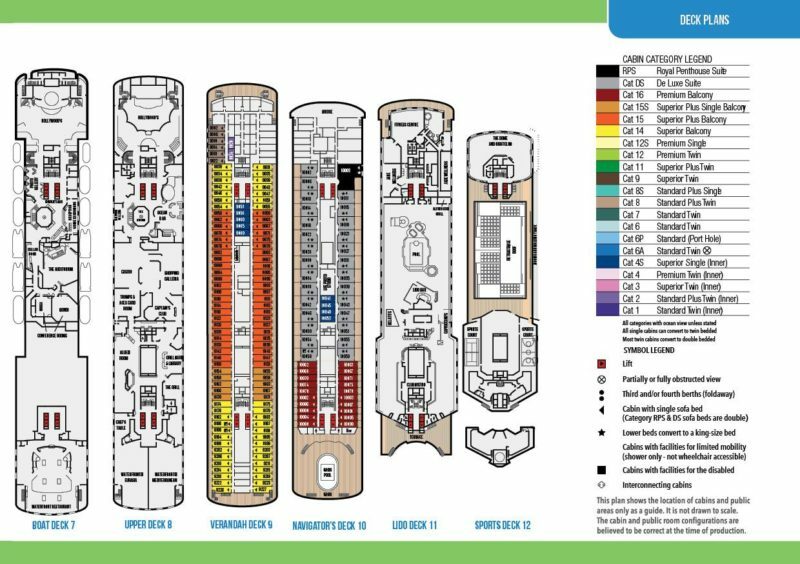 She has over 600 cabins, of which over 100 are singles, and she can host 1,150 happy vegan cruisers onboard. Cabins onboard are the kind you would find on most other cruise ships too. 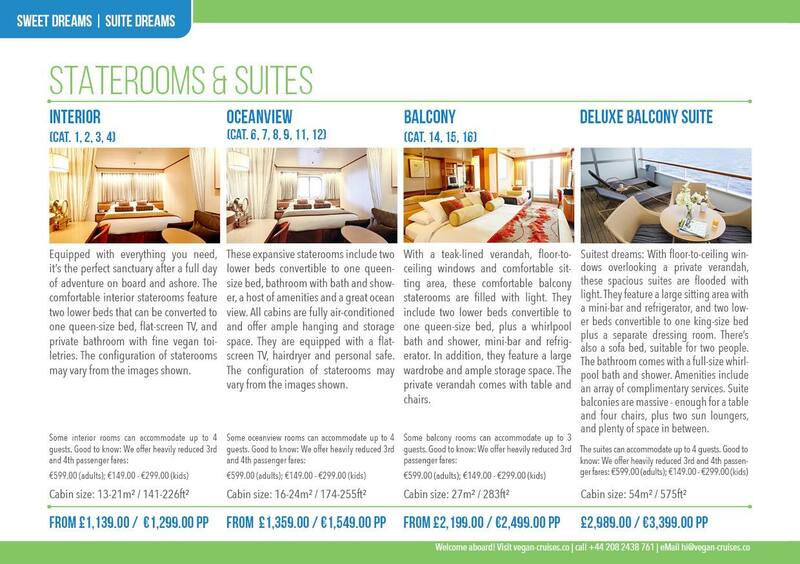 There are a number of inside cabins for best value (and best sleep) and a selection of both seaview and balcony cabins. For those wanting to travel in style, a small number of balcony suites are available too. Some of the cabins have interconnecting doors, making them ideal for groups or family use. Children’s fares start from 149EUR for the ten-day sailing which is unbelievable value, considering all meals and tips (service charge to cabin attendant & waiters) is also included in the fare. Third or fourth adult in the cabin qualifies for a sizeable discount too, further lowering the overall cost of the holiday if you can travel in groups of three or four. And if you don’t want to pay a single supplement, Vegan Travel can pair you up with another solo traveller of the same gender and language and you can both cruise at a standard twin rate. 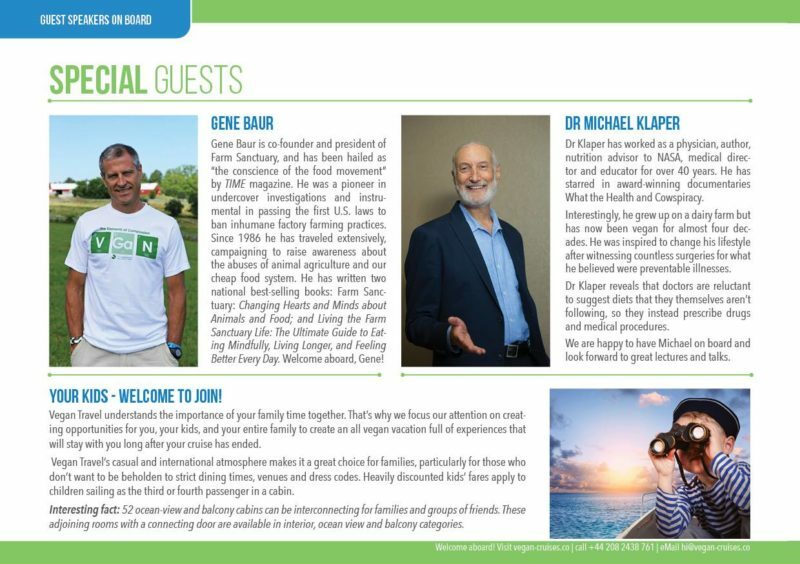 While Norwegian fjords cruise may have hosted Dr Greger as the main guest speaker (as you may have seen in the Youtube video above), the 2019 Baltic sailing offers even a more esteemed clinician & plant-based health educator as the main guest onboard. Even if you don’t immediately recognise Dr. Michael Klaper by his name, you will have seen him interviewed in various films about plant-based diets. These include Cowspiracy, What the Health, End of Meat etc. More guests will be named at later date, no doubt.. just like on the vegan Norway roundtrip cruise. But aren’t cruises expensive – what’s included in my fare? 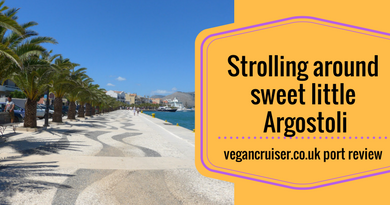 The one reason why Mr Vegancruiser and I ended up cruising as much as we do, is that we realised not just how convenient but also what fabulous value cruising is – see my top ten reasons to cruise here. 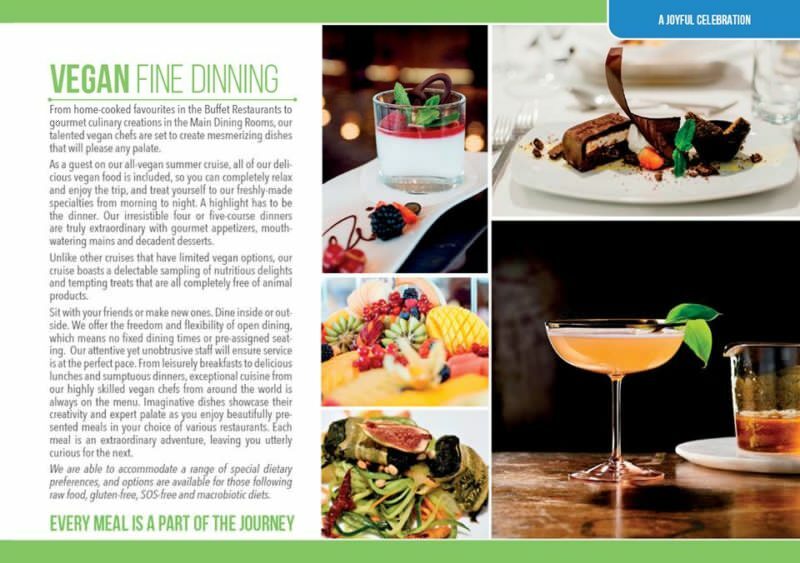 Your dining is normally included in the cruise fare (buffer & the main dining room) with the exception of some specialty dining restaurants. On Vegan Travel sailings, your meals are all included as well. All of the ship’s entertainment, cooking demonstrations and talks by guest speakers are yours to enjoy. The shipboard leisure facilities, little extras like afternoon tea onboard and the in-cabin coffee & tea facilities are yours to use too. Port taxes and fees are included. The gratuities (tips for your cabin attendant and restaurant servers) are also in your fare already – though you are free to tip the hardworking staff if they make a difference to your holiday. You only need to factor in the cost of travel (to and from Kiel), the cost of any drinks onboard over your cruise, any personal expenses (shopping/services) and any excursions you wish to book – if you wish to book any. We normally don’t, and just make our own way around the port. I must say that in St. Petersburg you NEED to either book a ship tour or a local tour company (who can put you onto their group visa) or you will need to arrange a separate Russian visa for yourself with the Russian consulate. I need to get onboard – where do we sail from? This year’s vegan Baltic cruise charters a CVM ship like the Norwegian fjords cruise, for the sole use of Vegan Travel guests. Unlike the 2017 sailing, the sailing does not depart from Tilbury but from Kiel, in Germany. 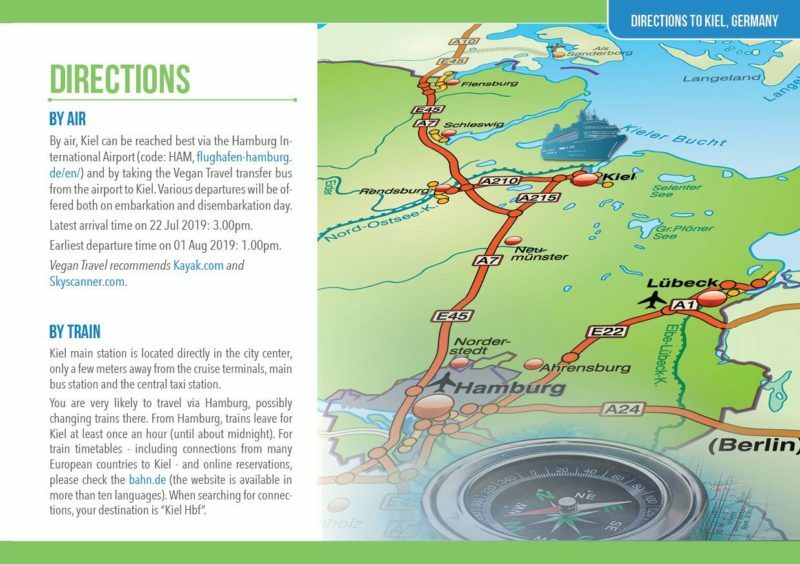 Hamburg airport is closest for those flying in and Kiel itself is a fequent, approx. 1h train journey away from Hamburg main railway station. Alternatively, should you not want to (or can’t) fly, a train journey from London St. Pancras utilising Eurostar services takes about 9 hours. Which would be an exciting journey itself! Like I said at the start – the above is not a paid advertisement. I am just an enthusiastic fan of the product having experienced one five-day river sailing with Vegan Travel. We essentially lived in a five-day vegan bubble, enjoying the destinations on the Rhine. 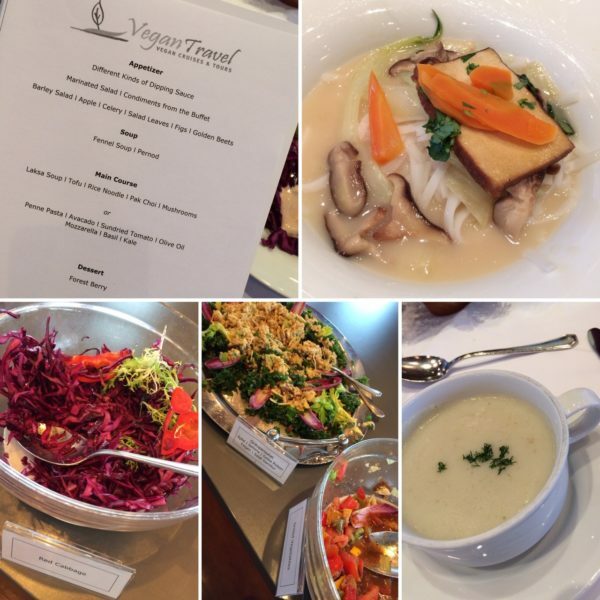 We devoured all of the beautiful vegan food (included in the cruise fare) as the onboard catering team was directed with Vegan Travel’s own executive chef. And of course, I cannot forget the fabulous company of fellow vegans onboard, such a treat. And the amazing vegan food, I did mention that, didn’t I? I would so love to be onboard for this Baltic cruise but for personal/financial reasons I am unlikely to make it. But please, do NOT miss your opportunity to have a fantastic vegan cruise holiday this summer! 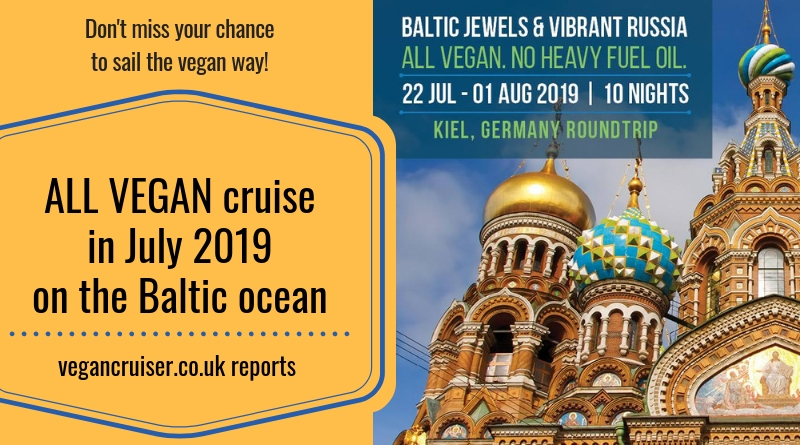 If like me, having 10 days off for the Baltic vegan cruise is looking difficult, do check out their various vegan river cruise options in Europe – and exotic Myanmar in 2020! I do hope to get onboard again at the end of the year.. The Douro river cruise hopefully! 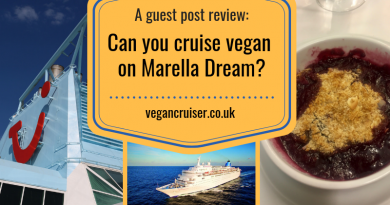 If you have sailed with Vegan Travel too, please do share your experience with the readers of this blog – I am sure people will want to hear about excellent vegan cruise options. I do! ← Brand new P&O vegan menu is here!